I am going to be honest here, I have had a slowwww start to this year and to this quarter in school in particular. It is all good, life is good, great actually. Nothing to complain about at all. It has just been a slow start, hence the repost, again. As a blogger friend pointed out last night, my posts are detailed and take me quite a bit of time. With this being my last quarter, my most time and brain consuming class thus far, I have not made enough time to do my usual be in the kitchen all week at home getting posts ready for you. For that, I apologize, but I know you understand. Give me another week and I feel I will catch up, get on track and bring you awesomeness. For now, I need to study for this crazy Food Service Financial Management test I have on Monday, and go for a walk to clear my brain, then study more. Thanks for understanding and being so awesome! 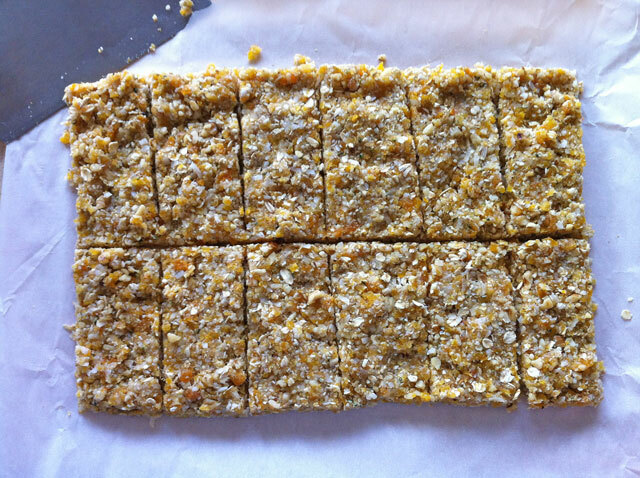 Here are some crazy good and healthy energy bars to pep you up! I am always looking for good ideas for snack time that are healthy and tasty. I need snacks in my life, I like em, and I enjoy having them around, we are friends snacks and I. Midday usually, the long wait from my lunch and dinner, I find myself wanting a little something, and it needs to be balanced and healthy. Proteins, grains, a little good fat, and I am set. So when I came across these bars from a fellow blogger I follow, I was happy happy. And let me tell something to you (insert accent), they are tasty treats full of nutritious happy stuff that will fill your belly, and keep you full until dinner, with a boost of energy. After all they are energy bars! 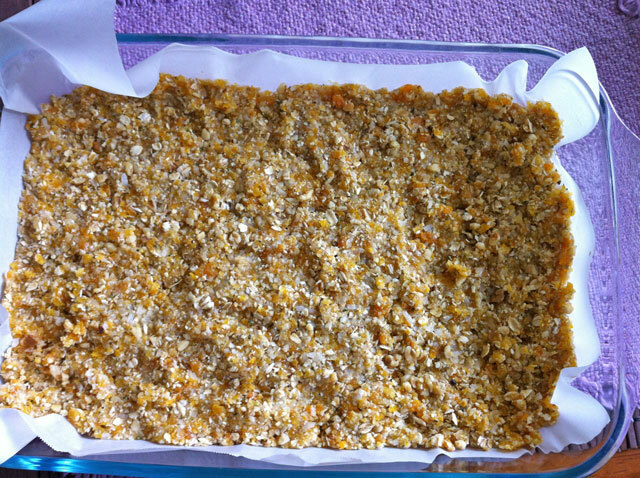 Added bonus… another easy breezy recipe to make. If you are super busy in the morning, you can grab one and go too! 1. Melt the coconut oil in the microwave in 20 second intervals until you can get the amount you need. 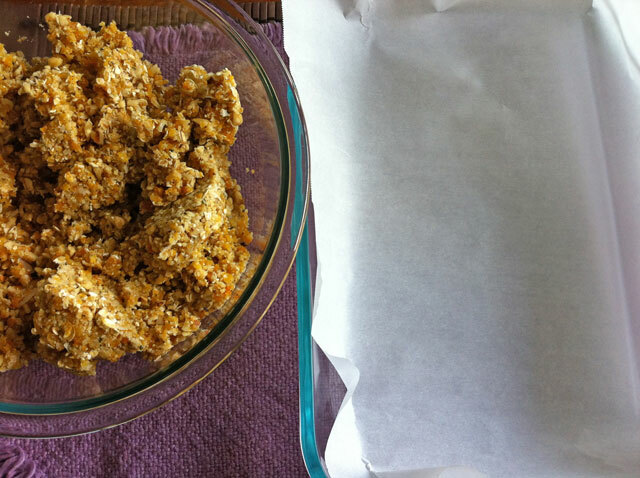 Line the pyrex with the parchment paper, set aside. 2. In a food processor, add the nuts and pulse until chunky, set aside. 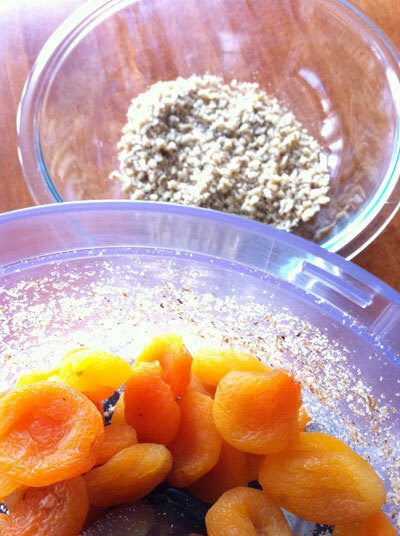 Add the apricots and pulse until bits and pieces. Add the coconut, oats, salt, hemp seeds, honey, and coconut oil. Pulse until it all comes together, then add the nuts, and pulse until it all comes together again. 3. Plop all the mixture into the pyrex, and flatten down with the back of a measuring cup, or spatula, cup probably works best. I forget to do this, it was fine, but totally do it, it will make it better. Cover and put in the freezer for an hour or so. 4. Remove from freezer, take the parchment out of the pyrex, and place the whole thing on a cutting board. Take a bench scraper or knife and cut the edges of to make smooth lines. Cut into whatever sizes you want. I did 2 x 4 ish, so I got 12 bars plus the end pieces for smaller snacks. 5. Place in an airtight container, and they hold for up to a month in the fridge! Side Note: The original recipe called for cashews, agave syrup, and ginger. 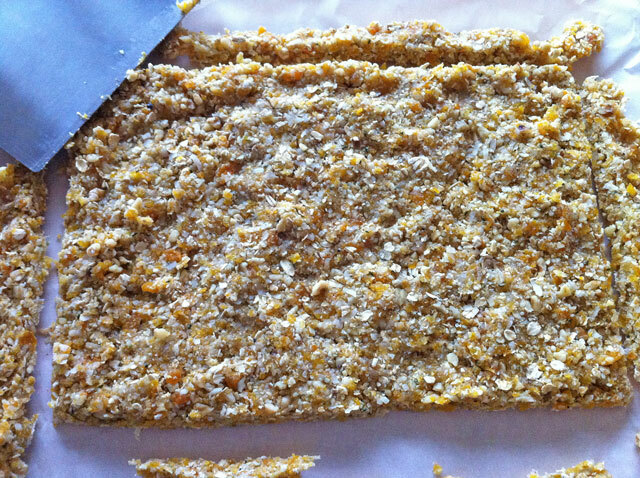 So you can imagine how you can make this from so many different nuts, and sweeteners. Try your favorite nuts, dried fruits, spices, sugars, and seeds. You could do chia seeds which are also super healthy. Just use the measurements as a general guideline if you need to. And leave a comment about what you made, I would love to hear about it! I want to try dried figs next time! I love that these have hemp seeds. I think they’re totally underutilized in baking and it’s a shame. They have such a great texture. Agreed! Thanks, they are yummy and super filling.